How do I create an available shift? There are multiple ways to make a shift available in Sling. 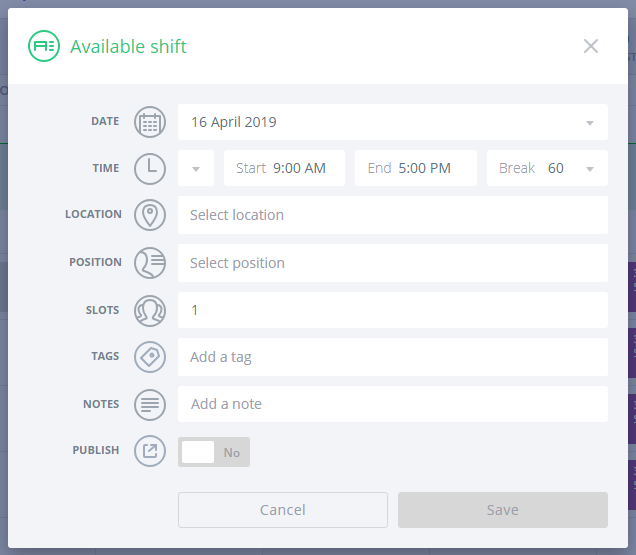 To create a new available shift, hover your mouse over a date in the available shifts row and click on the plus sign (+) that appears. A new window will pop up where you can enter the shift details. 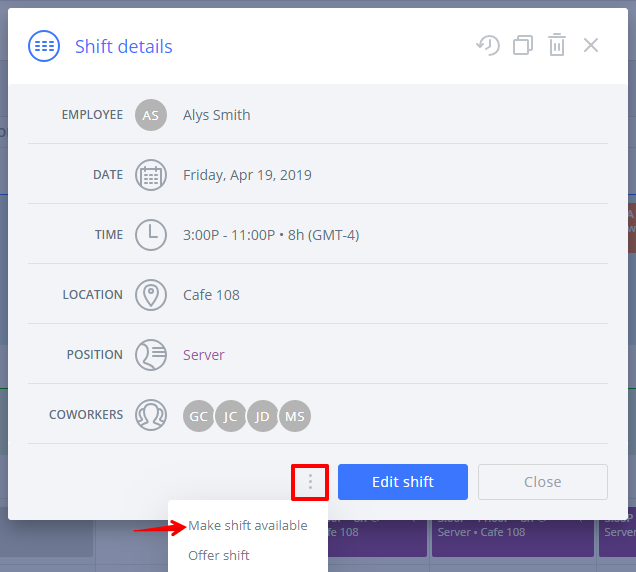 Available shifts can't be made recurring, so you will notice those options aren't shown. Premium and Business accounts will also see a field to designate how many slots need to be filled. Once you have all your details entered, you'll want to choose which publishing option you want to apply. Leaving the switch on "No" will add the shift to the calendar, but it will be invisible to employees. Switching it to "Yes" will publish the individual shift when you click Save and will alert any employee assigned to the same position and location as the shift. 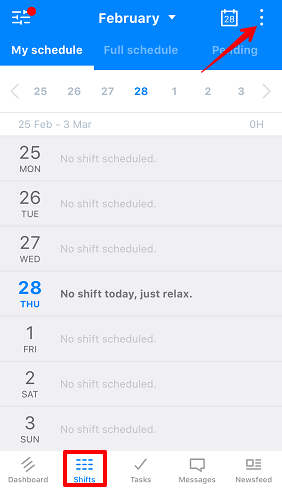 If you have existing shifts in the Unassigned row and want to make them available, it's very easy to move them. Go to the Week or Month view of the Schedule page and click the options button (3 dots) at the top right of the page. Select Make all unassigned shifts available and you will see all the unassigned shifts moved to available shifts. Individual shifts can be moved by drag and drop. This applies to unassigned shifts as well as assigned shifts, so if an employee notifies you that they are not able to work a shift already assigned to them, you can move it easily and find coverage. You can also click the shift to open its details and then click the options button (3 dots) to make a single shift available. Please note: Only shifts on the current and future dates can be made available. 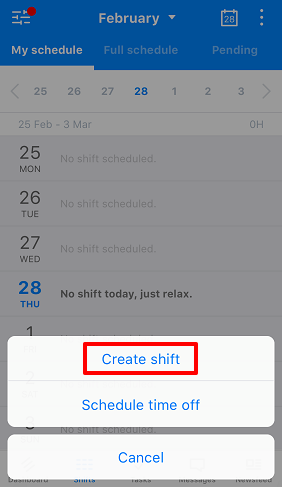 To create an available shift from the app, go to the Shifts tab and then tap the options button (3 dots) at the top right of the screen. In the pop-up, choose Create shift. On the next screen, enter all the shift details and make sure to switch the toggle shown to make it available. Just remember to save your changes (top right) when you're done! 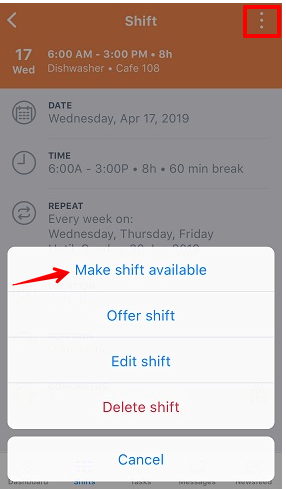 If you need to make an existing shift available from the app, go to the Full Schedule tab and tap the shift to open the details, then tap the options button at the top right of the screen. At the moment, there isn't an option to make all unassigned shifts available from the app, so if you need to do this, please log in from the website.